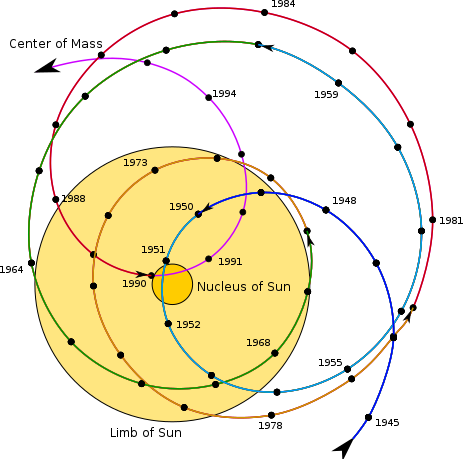 A heliocentric orbit (also called circumsolar orbit) is an orbit around the barycenter of the Solar System, which is usually located within or very near the surface of the Sun. All planets, comets, and asteroids in the Solar System, and the Sun itself are in such orbits, as are many artificial probes and pieces of debris. The moons of planets in the Solar System, by contrast, are not in heliocentric orbits, as they orbit their respective planet (although the Moon has a convex orbit around the Sun). The barycenter of the Solar System, while always very near the Sun, moves through space as time passes, depending on where other large bodies in the Solar System, such as Jupiter and other large gas planets, are located at that time. A similar phenomenon allows the detection of exoplanets by way of the radial-velocity method. The helio- prefix is derived from the Greek word "ἥλιος", meaning "Sun", and also Helios, the personification of the Sun in Greek mythology. The first spacecraft to be put in a heliocentric orbit was Luna 1 in 1959. An incorrectly timed upper-stage burn caused it to miss its planned impact on the Moon. A trans-Mars injection (TMI) is a heliocentric orbit in which a propulsive maneuver is used to set a spacecraft on a trajectory, also known as Mars transfer orbit, which will place it as far as Mars's orbit. Every two years, low-energy transfer windows open up, which allow movement between planets with the lowest possible delta-v requirements. Transfer injections can place spacecraft into either a Hohmann transfer orbit or bi-elliptic transfer orbit. Trans-Mars injections can be either a single maneuver burn, such as that used by the NASA MAVEN orbiter, or a series of perigee kicks, such as that used by the ISRO Mars Orbiter Mission. ^ "helio-". Dictionary.com Unabridged (v 1.1). Random House. 2006. Retrieved 2009-02-12. ^ ISRO successfully sends Mars orbiter into sun-centric orbit. ^ Orbiter successfully placed in Mars Transfer Trajectory. Earth Escape Explorer (CU-E3) is a nanosatellite of the 6-Unit CubeSat format that will demonstrate long-distance communications while in heliocentric orbit.The Earth Escape Explorer spacecraft is a student-driven effort at University of Colorado Boulder to design and build the spacecraft as part of the NASA CubeQuest Challenge. It will be one of thirteen CubeSats to be carried with the Orion EM-1 mission into a heliocentric orbit in cislunar space on the maiden flight of the Space Launch System, scheduled to launch in 2019. This is a list of active space probes which have escaped Earth orbit. It includes lunar space probes, but does not include space probes orbiting at the Sun–Earth Lagrangian points (for these, see List of objects at Lagrangian points). A craft is deemed "active" if it is still able to transmit usable data to Earth (whether or not it can receive commands). The craft are further grouped by mission status – "en route", "mission in progress" or "mission complete" – based on their primary mission. For example, though Voyager 1 is still contactable en route to the heliopause, it is listed as "mission complete" because its primary task of studying Jupiter and Saturn has been accomplished. Once a probe has reached its first primary target, it is no longer listed as "en route" whether or not further travel is involved. Below is a list of artificial objects currently in heliocentric orbit. This list does not include objects that are escaping from the Solar System, upper stages from robotic missions (only the S-IVB upper stages from Apollo missions with astronauts are listed), or objects in the Sun–Earth Lagrange points. Luna 1, also known as Mechta (Russian: Мечта [mʲɪt͡ɕˈta], lit. : Dream), E-1 No.4 and First Lunar Rover , was the first spacecraft to reach the vicinity of the Earth's Moon, and the first spacecraft to be placed in heliocentric orbit. Intended as an impactor, Luna 1 was launched as part of the Soviet Luna programme in 1959, however due to an incorrectly timed upper stage burn during its launch, it missed the Moon, in the process becoming the first spacecraft to leave geocentric orbit. While traveling through the outer Van Allen radiation belt, the spacecraft's scintillator made observations indicating that a small number of high-energy particles exist in the outer belt. The measurements obtained during this mission provided new data on the Earth's radiation belt and outer space. The Moon was found to have no detectable magnetic field. The first-ever direct observations and measurements of the solar wind, a strong flow of ionized plasma emanating from the Sun and streaming through interplanetary space, were performed. That ionized plasma concentration was measured to be some 700 particles per cm3 at altitudes 20–25 thousand km and 300 to 400 particles per cm3 at altitudes 100–150,000 km. The spacecraft also marked the first instance of radio communication at the half-million-kilometer distance. A malfunction in the ground-based control system caused an error in the rocket's burntime, and the spacecraft missed the target and flew by the Moon at a distance of 5,900 km (more than three times the Moon's radius) at the closest point. Luna 1 then became the first man-made object to reach heliocentric orbit and was then dubbed a "new planet" and renamed Mechta (Dream). Luna 1 was also referred to as the "First Cosmic Rocket", in reference to its achievement of escape velocity. Mariner 5 (Mariner Venus 1967) was a spacecraft of the Mariner program that carried a complement of experiments to probe Venus' atmosphere by radio occultation, measure the hydrogen Lyman-alpha (hard ultraviolet) spectrum, and sample the solar particles and magnetic field fluctuations above the planet. Its goals were to measure interplanetary and Venusian magnetic fields, charged particles, plasma, radio refractivity and UV emissions of the Venusian atmosphere. Mariner 5 was actually built as a backup to Mariner 4, but after the success of the Mariner 4 mission, it was modified for the Venus mission by removing the TV camera, reversing and reducing the four solar panels, and adding extra thermal insulation. Liftoff took place on June 14, 1967 from Cape Canaveral Air Force Station Launch Complex 12 on Atlas vehicle 5401. Booster performance was normal through the Atlas portion of the launch and the first Agena burn, with all systems operating at the proper level. During the second Agena burn, abnormal fluctuations in the engine chamber pressure occurred, however they did not preclude successful interplanetary injection. There had been several occurrences of this behavior on previous NASA and Air Force launches and a program was initiated to correct it which led to a redesign of the Agena turbopump gearbox. Mariner 5 flew by Venus on October 19 that year at an altitude of 3,990 kilometers (2,480 mi). With more sensitive instruments than its predecessor Mariner 2, Mariner 5 was able to shed new light on the hot, cloud-covered planet and on conditions in interplanetary space. Radio occultation data from Mariner 5 helped to understand the temperature and pressure data returned by the Venera 4 lander, which arrived at Venus shortly before it. After these missions, it was clear that Venus had a very hot surface and an atmosphere even denser than expected. The operations of Mariner 5 ended in November 1967 and it is now defunct in a heliocentric orbit. Mars 4 (Russian: Марс-4), also known as 3MS No.52S was a Soviet spacecraft intended to explore Mars. A 3MS spacecraft launched as part of the Mars programme, it was intended to enter orbit around Mars in 1974. However, computer problems prevented orbital insertion from occurring. Mars 6 (Russian: Марс-6), also known as 3MP No.50P was a Soviet spacecraft launched to explore Mars. A 3MP bus spacecraft launched as part of the Mars programme, it consisted of a lander, and a coast stage with instruments to study Mars as it flew past. Mars 7 (Russian: Марс-7), also known as 3MP No.51P was a Soviet spacecraft launched to explore Mars. A 3MP bus spacecraft which comprised the final mission of the Mars programme, it consisted of a lander and a coast stage with instruments to study Mars as it flew past. Due to a malfunction, the lander failed to perform a maneuver necessary to enter the Martian atmosphere, missing the planet and remaining in heliocentric orbit along with the coast stage. Phobos 1 was an unmanned Russian space probe of the Phobos Program launched from the Baikonour launch facility on 7 July 1988. Its intended mission was to explore Mars and its moons Phobos and Deimos. The mission failed on 2 September 1988 when a computer malfunction caused the end-of-mission order to be transmitted to the spacecraft. At the time of launch it was the heaviest interplanetary spacecraft ever launched, weighing 6200 kg. Ranger 3 was a space exploration mission conducted by NASA to study the Moon. The Ranger 3 robotic spacecraft was launched January 26, 1962 as part of the Ranger program. Due to a series of malfunctions, the spacecraft missed the Moon by 22,000 mi (35,000 km) and entered a heliocentric orbit.The Ranger 3 space probe was designed to transmit pictures of the lunar surface during a period of 10 minutes of flight prior to impacting on the Moon, to rough-land a seismometer capsule on the Moon, to collect gamma-ray data in flight, to study radar reflectivity of the lunar surface, and to continue testing of the Ranger program for development of lunar and interplanetary spacecraft. Shin'en, known before launch as UNITEC-1 or UNISEC Technology Experiment Carrier 1, is a Japanese student spacecraft which was intended to make a flyby of Venus in order to study the effects of interplanetary spaceflight on spacecraft computers. In doing so, it was intended to become the first student-built spacecraft to operate beyond geocentric orbit. It was operated by UNISEC, a collaboration between several Japanese universities. Contact was lost shortly after launch. Vega 1 (along with its twin Vega 2) is a Soviet space probe part of the Vega program. The spacecraft was a development of the earlier Venera craft. They were designed by Babakin Space Centre and constructed as 5VK by Lavochkin at Khimki. The name VeGa (ВеГа) combines the first two letters Russian words for Venus (Венера: "Venera") and Halley (Галлея: "Galleya"). The craft was powered by twin large solar panels and instruments included an antenna dish, cameras, spectrometer, infrared sounder, magnetometers (MISCHA), and plasma probes. The 4,920 kg craft was launched by a Proton 8K82K rocket from Baikonur Cosmodrome, Tyuratam, Kazakh SSR. Both Vega 1 and 2 were three-axis stabilized spacecraft. The spacecraft were equipped with a dual bumper shield for dust protection from Halley's comet. Vega 2 (along with Vega 1) is a Soviet space probe part of the Vega program. The spacecraft was a development of the earlier Venera craft. The name VeGa (ВеГа) combines the first two letters Russian words for Venus (Венера: "Venera") and Halley (Галлея: "Galleya") They were designed by Babakin Space Centre and constructed as 5VK by Lavochkin at Khimki. The craft was powered by twin large solar panels and instruments included an antenna dish, cameras, spectrometer, infrared sounder, magnetometers (MISCHA), and plasma probes. The 10,850 pounds (4,920 kg) craft was launched by a Proton 8K82K rocket from Baikonur Cosmodrome, Tyuratam, Kazakh SSR. Both Vega 1 and 2 were three-axis stabilized spacecraft. The spacecraft were equipped with a dual bumper shield for dust protection from Halley's Comet. Venera 1 (Russian: Венера-1 meaning Venus 1), also known as Venera-1VA No.2 and occasionally in the West as Sputnik 8 was the first spacecraft to fly past Venus, as part of the Soviet Union's Venera programme. Launched in February 1961, it flew past Venus on 19 May of the same year; however, radio contact with the probe was lost before the flyby, resulting in it returning no data. The Venera 12 (Russian: Венера-12 meaning Venus 12) was a Soviet unmanned space mission to explore the planet Venus. Venera 12 was launched on 14 September 1978 at 02:25:13 UTC.Separating from its flight platform on December 19, 1978, the lander entered the Venus atmosphere two days later at 11.2 km/s. During the descent, it employed aerodynamic braking followed by parachute braking and ending with atmospheric braking. It made a soft landing on the surface at 06:30 Moscow time (0330 UT) on 21 December after a descent time of approximately 1 hour. The touchdown speed was 7–8 m/s. Landing coordinates are 7°S 294°E. It transmitted data to the flight platform for 110 minutes after touchdown until the flight platform moved out of range while remaining in a heliocentric orbit. Identical instruments were carried on Venera 11 and 12. Venera 2 (Russian: Венера-2 meaning Venus 2), also known as 3MV-4 No.4 was a Soviet spacecraft intended to explore Venus. A 3MV-4 spacecraft launched as part of the Venera programme, it failed to return data after flying past Venus. Venera 2 was launched by a Molniya carrier rocket, flying from Site 31/6 at the Baikonur Cosmodrome. The launch occurred at 05:02 UTC on 12 November 1965, with the first three stages placing the spacecraft and Blok-L upper stage into a low Earth parking orbit before the Blok-L fired to propel Venera 2 into heliocentric orbit bound for Venus, with perihelion of 0.716 AU, aphelion of 1.197 AU, eccentricity of 0.252, inclination of 4.29 degrees and orbital period of 341 days. The Venera 2 spacecraft was equipped with cameras, as well as a magnetometer, solar and cosmic x-ray detectors, piezoelectric detectors, ion traps, a Geiger counter and receivers to measure cosmic radio emissions. The spacecraft made its closest approach to Venus at 02:52 UTC on 27 February 1966, at a distance of 23,810 kilometres (14,790 mi).During the flyby, all of Venera 2's instruments were activated, requiring that radio contact with the spacecraft be suspended. The probe was to have stored data using onboard recorders, and then transmitted it to Earth once contact was restored. Following the flyby the spacecraft failed to reestablish communications with the ground. It was declared lost on 4 March. An investigation into the failure determined that the spacecraft had overheated due to a radiator malfunction. Zond 3 was a 1965 space probe which performed a flyby of the Moon's far side, taking a number of quality photographs for its time. It was a member of the Soviet Zond program while also being part of the Mars 3MV project. It was unrelated to Zond spacecraft designed for manned circumlunar missions (Soyuz 7K-L1). It is believed that Zond 3 was initially designed as a companion spacecraft to Zond 2 to be launched to Mars during the 1964 launch window. The opportunity to launch was missed, and the spacecraft was launched on a Mars-crossing trajectory as a spacecraft test, even though Mars was no longer attainable.